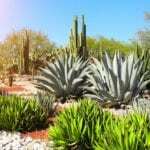 Yuccas are popular accent plants that contribute a desert-like or tropical look to gardens and landscapes. Unlike some yucca species, curved leaf yucca can grow in relatively cool and wet regions. A curved leaf yucca growing in a courtyard or a rock garden adds a decorative touch. 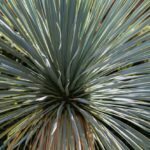 What is Curved Leaf Yucca? Curved leaf yucca (Yucca recurvifolia, also known as Yucca gloriosa var. recurvifolia) is popular in ornamental gardens, and it has the advantage of having leaf tips that are less sharp than in other yucca species. Yuccas are related to agaves and, like them, are native to the Americas. This species is native to the Southeastern United States. However, it can grow across the U.S. in zones 7 to 11, from Arizona to the Pacific Northwest, and also in similar climates worldwide. Curved leaf yucca plants have long, narrow leaves that are bendable and curve downward toward the tips, giving the plant its name. The blue-green leaves are 1.5 to 3 feet (0.4 to 0.9 meters) long. Varieties with variegated and other unusually colored leaves are available. Each plant usually produces one semi-woody stem but may produce branches. Curved leaf yucca flowers appear in late spring or early summer, and in some areas, the plant can bloom again in fall. The white, bell-shaped flowers are borne on a large, showy flower cluster up to 5 feet (1.5 meters) tall. First, choose an appropriate location for the plant. Curved leaf yucca is a large evergreen shrub that grows 6 to 10 feet (1.8 to 3 meters) tall. Full sun is best in most regions, but in very hot locations like the American Southwest deserts, this plant should be shielded from intense sun by placing it in partial shade. A curved leaf yucca growing in a well-drained soil will be healthiest and look its best. Curved leaf yucca care includes regular watering; although the plant is drought tolerant, it will look its best if kept watered. 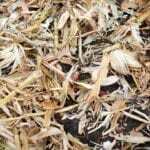 Pruning is not necessary or beneficial, except that dead leaves should be removed at their base. Spider mites may infest the plant and should be washed away by hosing down the plant. Propagate curved leaf yucca by seed, by division, or by making short cuttings from the stem.